Octopus needs long, slow cooking to tenderize the meat, which is concentrated almost exclusively in the tentacles. Braising and boiling are ideal for the challenge, but bear in mind the meat’s high water content causes it to shrink considerably during cooking. Although octopus is bought straight off the dock throughout the Mediterranean, it is rarely sold fresh overseas. A 2- to 4-pound octopus, the typical size for a frozen octopus, will serve four. Since fresh octopus spoils quickly, it is nearly always sold frozen, in which case it will already have been cleaned and prepared. On the plus side, octopus is one of the few foods to benefit from freezing, since the process has a tenderizing effect on the meat. If cooking from frozen, you will need to thaw it slowly in the refrigerator for up to 24 hours. If you do manage to get your hands on fresh octopus, ask the fishmonger to remove the innards, beak and ink sac. Some cooks prefer to tenderize the meat first by hammering it with a cook’s mallet or slapping the tentacles on a counter top. 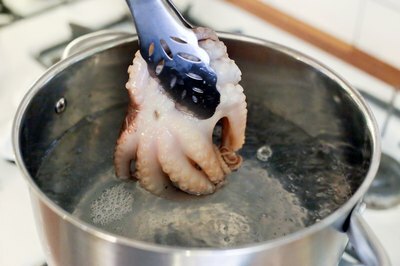 Wash the octopus under cold, running water and peel away the thin skin with your fingers, although again some cooks prefer to leave it on for its gelatinous texture. If you throw octopus directly onto a hot grill you will end up with meat that is tough and rubbery. 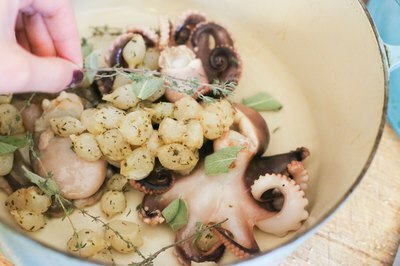 Instead, first simmer the whole octopus, comprising the tentacles and thin skirt only at this point, in white wine or water, with aromatic vegetables and a bay leaf if desired, for up to an hour until it is tender. Remove the octopus from the liquid and season with olive oil and lemon juice, then transfer it to the grill and cook it evenly on both sides until it is crispy, around four minutes per side. 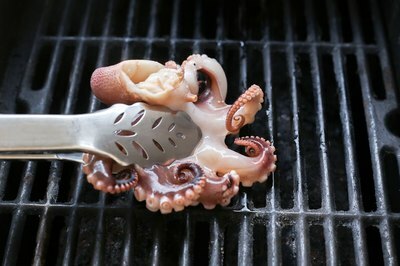 Remove the octopus from the grill and cut the tentacles up into smaller sections with a sharp knife. The tough connective tissue in octopus begins to dissolve into gelatin at around 130 degrees Fahrenheit, but the meat will still need a slow simmer for up to an hour to produce a palatable, tender result. The New York Times recommends simmering the octopus whole at between 190 and 200 degrees F. Numerous tricks help tenderize the meat further, either by adding a dash of vinegar to the water, or by bringing the pan first to a rolling boil, dunking the whole octopus in the water three times, then reducing the heat and cooking it on a slow simmer for an hour. Once the octopus is tender, remove it from the heat, let it cool to room temperature, and slice into smaller sections. Season with salt, pepper and lemon juice for taste. Since octopus meat is so full of liquid, it lends itself to dry braising in its own juices. Heat an oven to 450 degrees Fahrenheit and arrange chopped octopus pieces in a Dutch oven with vegetables such as potatoes and carrots, herbs and olive oil. Bake for an hour with the lid tightly sealed, then add a cup of white wine and bake for a further 30 minutes. The octopus is ready when the tines of a fork slide easily into the flesh. Once the octopus is cooked, allow it to rest until it reaches room temperature. For pasta dishes, you can dry braise octopus in a Dutch oven with just a slug of olive oil and some onion for a couple of hours and reserve the resulting juices for a pasta sauce. 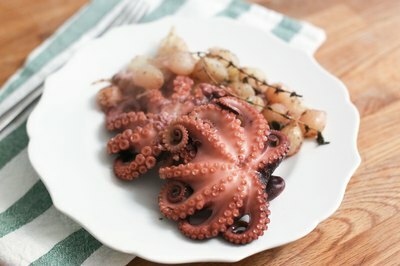 How Do I Prepare an Octopus to Make Sashimi?